At Sully's Chocolates, we pack more fudge into our product than all of our competitors combined. There's no such thing as "2 big" as far as Sully's concerned. "For once, a large package doesn't disappoint" Andrew thought to himself. Be safe: eat it with the wrapper on. You'll really enjoy the thick, creamy filling. 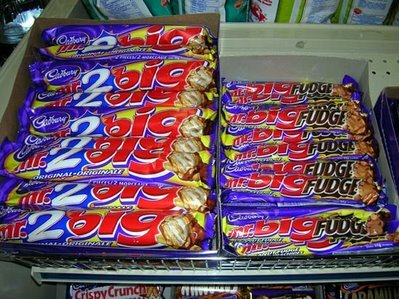 Reversing stereotypes, Mr. 2 Big Fudge was only half the size of Mr. 2 Big Vanilla. 'Ow to speak Michael Moore: "light snack." I quickly turned and walked away, as momma had always told me to avoid gaybars. HT: Divine the Miss M.
Andrew Sullivan: "What do you mean they're supposed to be eaten?" Sully-san thank you; the best his life; now die happy. This is what Michael Moore refers to as a "light snack."